Recently, someone forwarded me a blog post about a Social Network Operating System and what that might mean. I'll tell you what it means: nothing. Much like the Chewbacca Defense, it doesn't make sense. Unix: An operating system. Huzzah! We've correctly identified one! 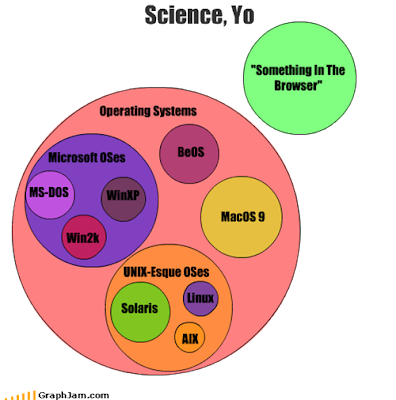 "Something in the browser": Not an operating system. Lest we forget history, Ted Dziuba already told us what we need to know about this subject. The irony is that what Chris is talking about early in the post is quite a useful thing to have, which is a set of underlying services that will allow people to develop new social applications easily that combine features and data from other social applications. But that's not an Operating System. It's also not a Relational Database, a B-Tree, a Hash Table, a Compiler, or a Micro-Kernel. All of these things have pretty precise meanings that everybody understands, and the precision facilitates conversation. Let's keep the conversation back on precise terminology. (And inventing your own terminology is fine as well if there's no term that precisely describes your use case [that's how we got Micro-Kernel for example], just don't reuse one).